Elouise (Lou) Parker is determined to have the absolute best, most impossibly epic summer of her life. There are just a few things standing in her way: * She's landed a job at Magic Castle Playland . . . as a giant dancing hot dog. * Her crush, the dreamy Diving Pirate Nick, already has a girlfriend, who is literally the Princess of the park. But Lou's never liked anyone, Elouise (Lou) Parker is determined to have the absolute best, most impossibly epic summer of her life. There are just a few things standing in her way: * She's landed a job at Magic Castle Playland . . . as a giant dancing hot dog. * Her crush, the dreamy Diving Pirate Nick, already has a girlfriend, who is literally the Princess of the park. But Lou's never liked anyone, guy or otherwise, this much before, and now she wants a chance at her own happily ever after. * Her best friend, Seeley, the carousel operator, who's always been up for anything, suddenly isn't when it comes to Lou's quest to set her up with the perfect girl or Lou's scheme to get close to Nick. * And it turns out that this will be their last summer at Magic Castle Playland--ever--unless she can find a way to stop it from closing. 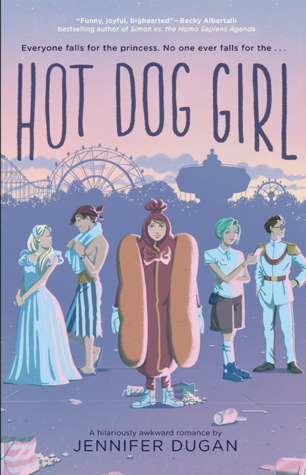 Jennifer Dugan's sparkling debut coming-of-age queer romance stars a princess, a pirate, a hot dog, and a carousel operator who find love--and themselves--in unexpected people and unforgettable places.